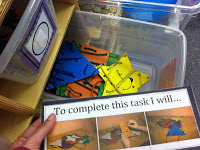 I have adapted the TEACCH system into my classroom and altered it to fit my student's needs. 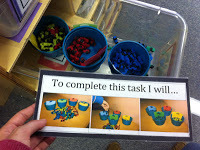 I have an intricate system of Task Boxes that we do on a daily basis at the red table. 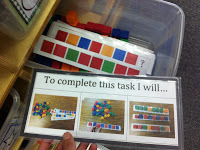 Every student has their individual task schedule. They know to pick the visual icon from top to bottom. 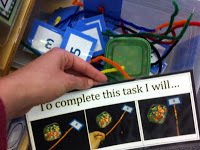 Students take the first task (purple circle) to the task boxes and match it to the task box. 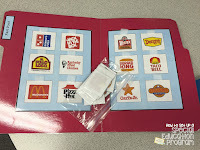 The task boxes all have a velcro spot on the outside for them to place the icon on while they are working to complete the task. 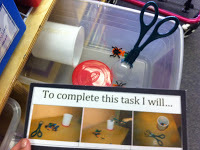 The student's then take their task box to their spot at the red table and take out the contents of the task. 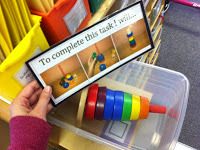 All student's work as independently as possible to compete the task. 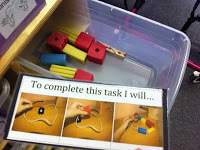 Tasks range from math, language arts, pre-academic, sensory, monthly themes and pre-academic skills. 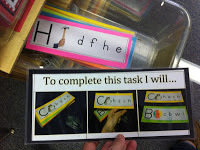 Every task has a visual direction card for the student to follow. 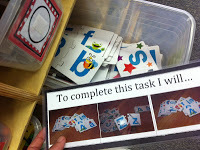 Once the student completes the task at hand, they return the task box to the labeled slot on the shelf and place the icon in the finished box. They then check their schedule for the next task. A lot of these materials are freebies I found online or on Pinterest. You can make anything into a task that's why I love the whole system. This is used as independent work for my class. 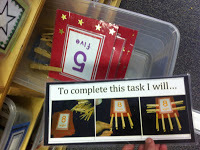 I choose to not do any paper/pencil task boxes because we have writing and reading centers in the morning! 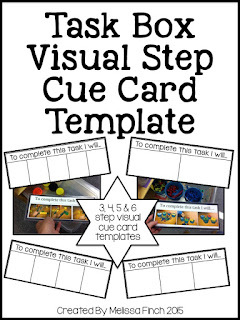 Looking to create your own visual cue card templates? 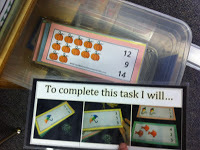 Click below to purchase my task box templates!!! 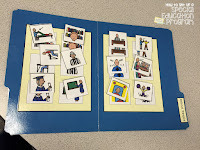 File Folders are quick, easy to use activities. 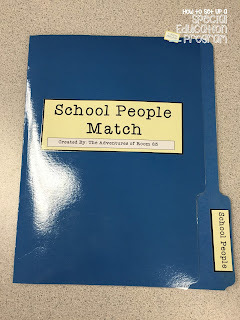 They are great because you can create file folder activities for any skill you want to target with your students. 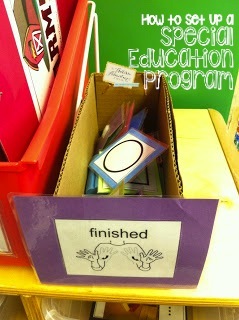 I store my file folder activities in this file organizer with my task boxes. Tomorrow I will go into detail about my T.E.A.C.C.H. Binder Work System. 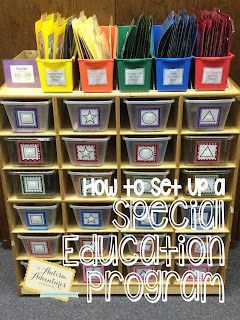 This is a new program I have designed that will work GREAT for your students…. keep them busy and targeting those crucial skills at the same time!!! 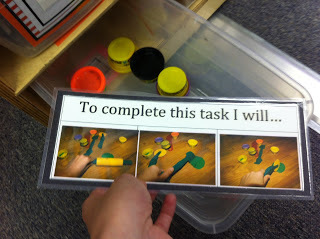 I love the idea of using a color system, I'm sure it makes storing and locating materials for tasks. I also like the idea of using Velcro on the outside of the box and switching the materials rather than having tons of boxes stored somewhere. How do you store unused materials? 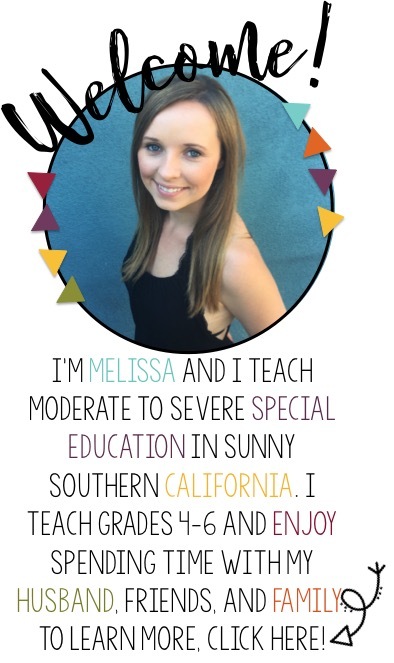 I am making a big change from a resource position to a self contained autism program so I've been looking for tips as I get things set up, this post is very helpful! Thank you! How/when do students get their work checked? Is there an adult that is around but not hovering to check their work? Excellent job! The visuals are amazing. 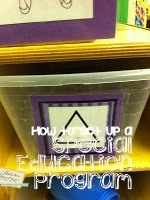 SPECIAL ED Back To School Tips & Freebies!